to a full house at The Bugle Boy. We’ve all been there. Paid good money for tickets to see a musician perform live. Waited with anticipation for the big night, and then … disappointment. Not because of the musician. Because of the jerk behind you who wouldn’t shut up … or the clueless person on their cell phone half the night. in this former World War II Army barracks. But imagine if you will, a place where people sit quietly, comfortably, and get to hear … really HEAR … musical artists. A place where cell phones are silenced, and where the entire audience is there to listen and soak in the music. Yes, Virginia, there really is such a place. 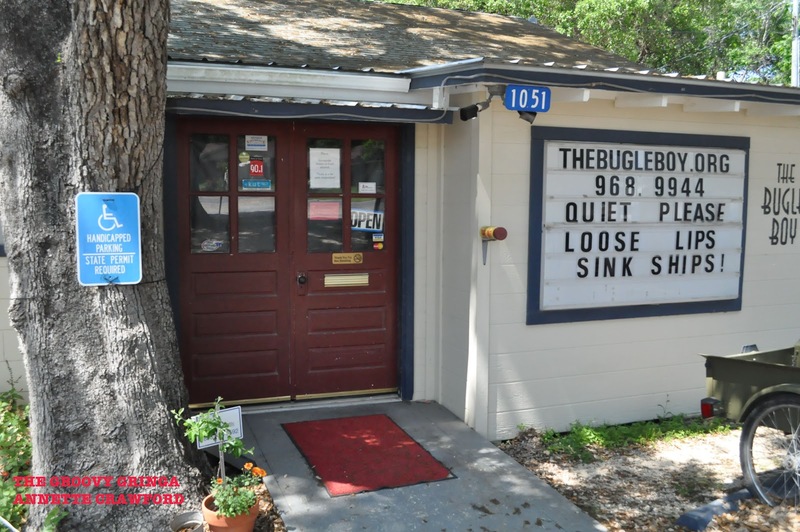 You can stop imagining it and start living it at The Bugle Boy in La Grange, about two hours east of San Antonio. The main entrance to The Bugle Boy on Highway 77 in La Grange. 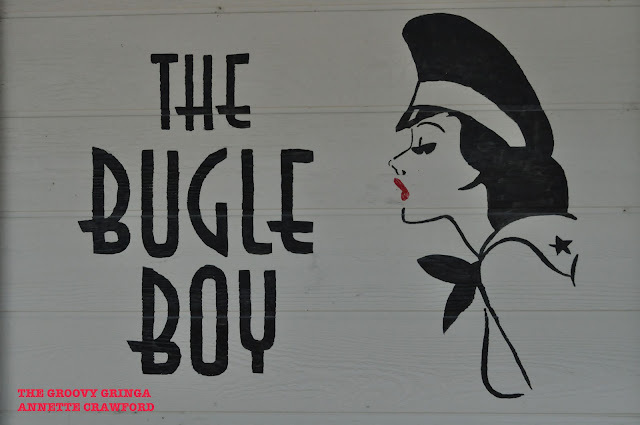 The Bugle Boy is one of those buildings that makes you wish walls could talk. It started life as a World War II Army barracks at Camp Swift Infantry Base in Bastrop. After the war, it was bought by an order called the Sons of Hermann, a society created in 1840 that provided inexpensive insurance and mutual aid for German immigrants. The Sons of Hermann moved the building to its present location on Highway 77 in La Grange, and held their meetings there until 2004. That’s when music lover Lane Gosnay stepped into the picture, first investing with a partner and then buying the building on her own within the first year. 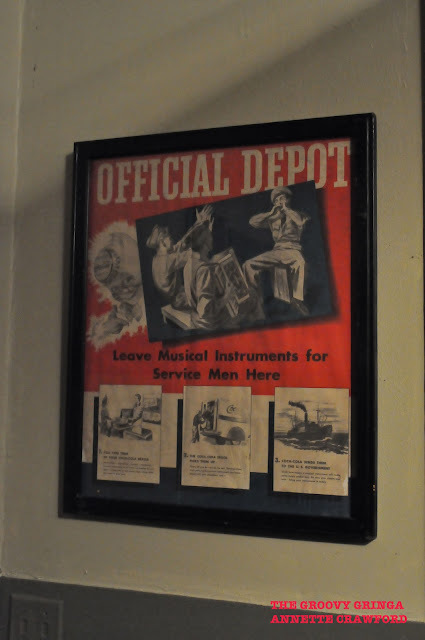 Initially, The Bugle Boy was a coffeehouse by day, and a music venue on Friday and Saturday nights. But the daytime traffic was sporadic so that’s when Lane decided to focus solely on the music. “It was obvious that our draw only came from the concerts and trying to be a daytime coffeehouse was not working for our location,” she said. The Bugle Boy logo, painted on the outside of the building. And so, drawing on her experience with promoting artists, Lane designed the space that would allow her to control her environment. 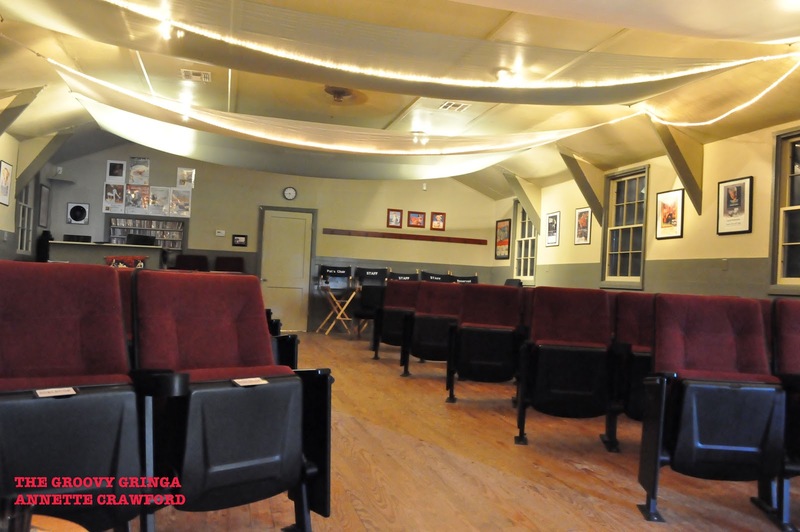 She turned The Bugle Boy into an 80-seat listening room … a place where both the artists and the audience could enjoy the evening and get the respect they deserve. 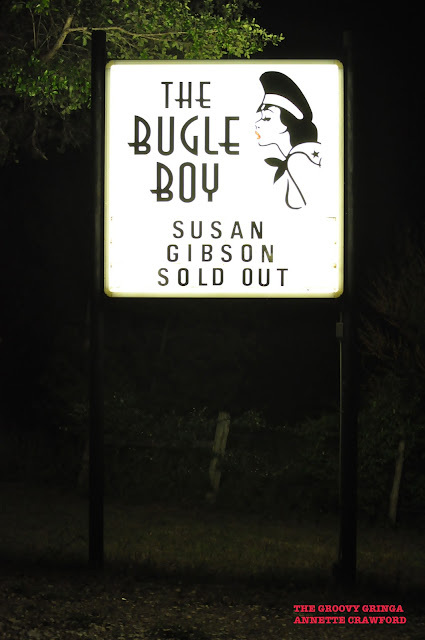 There are several things that set The Bugle Boy apart from other venues. It is operated by The Bugle Boy Foundation, a 501(c)(3) non-profit arts organization. The staff is a loyal corps of volunteers. World War II Army barracks. And, as of Jan. 14, 2012, it became the first Fair Trade Venue in Texas. Among other commitments, this means that the venue agrees to pay the musician at least the agreed upon minimum wage, no matter what the audience size. Originally from Orange, Texas, Lane moved to Dallas when she was 7 and then went to college at Texas A&M in Galveston. It was here that she met her first musician friend, helping her land a long-time gig as a drummer in a local band. After graduation, she took her degree in Marine Transportation and put it to work in San Diego but she didn’t leave music behind – she started a musicians’ network. Years later, while working as a game warden in Cameron County, Texas, she was injured on the job and made a career change. When she moved to Austin she immersed herself in music once again. She booked a few artists and produced some shows at various venues around the state. “I just always loved promoting talented people because it just seemed THAT important,” she said. While Lane has dabbled in lyrics and had a few of her songs put to music, she admits she “can’t play a thing.” But that’s OK … she has surrounded herself with great artists who CAN play. “We run a strict 8 to 10 p.m. format and we generally stick to it because it works best for such a focused attentive audience,” Lane said, but two high-energy shows stand out in her mind – Carolyn Wonderland and Woody Russell. “Each artist was asking me from the stage if their time was up. On both occasions I walked to the stage and picked up the clock that lays at the base of the performer’s mic stand, tossed it on the wooden floor in front of the audience and smashed it to bits with my boot heel. When I first heard of The Bugle Boy from some fellow music lovers I thought it sounded too good to be true. After visiting the website I knew I had to experience this place myself and so I scanned the upcoming shows, trying to find something that would work with my schedule. I wanted to see someone whose music I knew, but had never seen live. That performer turned out to be Susan Gibson, and she proved to be the perfect introduction to this venue. Susan has a knack for making people feel comfortable around her. By the time intermission rolled around I felt as if we had gone to school together. By the end of the show I was ready to go on a road trip with her. 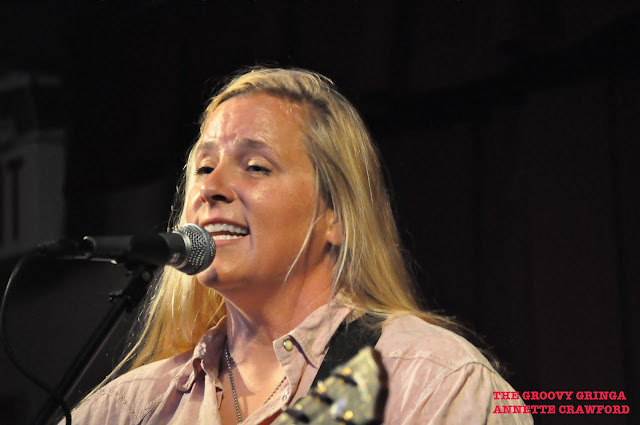 Susan Gibson, songwriter of the CMA award-winning "Wide Open Spaces,"
which was a huge hit for the Dixie Chicks. Susan’s a talented storyteller and songwriter. She jokes about recording a Greatest Hit album, including her CMA award-winning “Wide Open Spaces” on all 14 tracks. It was named the Country Music Association Single of the Year in 1999 when it was recorded by the Dixie Chicks, and it was the No. 1 song on the country western charts for several weeks in both the U.S. and Canada. While I loved hearing her sing “Wide Open Spaces,” I enjoyed even more the songs about her niece and nephew, her dog, her life on the road. Hearing her tell the stories behind the songs made it that much more special, as if I was watching a VH1 Storytellers special. Surely, it was a special evening to remember. Certainly the atmosphere of The Bugle Boy contributed to the familial atmosphere of the evening. Even though I was only there last week, I’m already checking out their schedule, trying to figure out the next show I’ll get to enjoy. But if I can't make it to a show I really want to see, there will soon be a remedy for that. Lane announced an exciting development Saturday that will begin either late this month or early May. Through a service called Concert Window, you'll be able to get live concert streaming on your computer for a nominal cost. “It is not a substitute for enjoying the show live but at least folks can check us out and come when they can,” Lane said. The only problem I anticipate with getting hooked on The Bugle Boy is that it will spoil me. I will come to expect such experiences as the norm. No chatter. No annoying cell phones. No loud, obnoxious drunks. Just music. Pure, amazing live music. Thanks, Joanna! I wish I lived closer to La Grange so I could go more often.